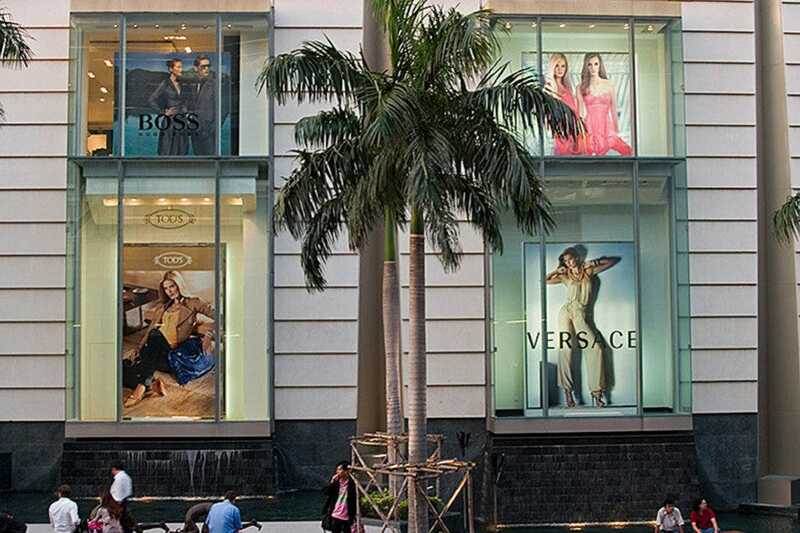 Bangkok is one of the world’s premiere shopping meccas. 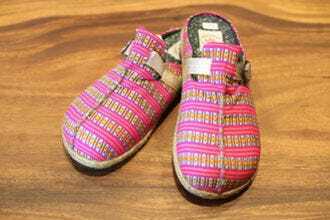 For something smaller scale and personalized, you can check out cutting edge Thai design from the women's clothing designer Senada Theory, or get your own handmade and fitted suit made by the trustworthy Pinky Tailor. 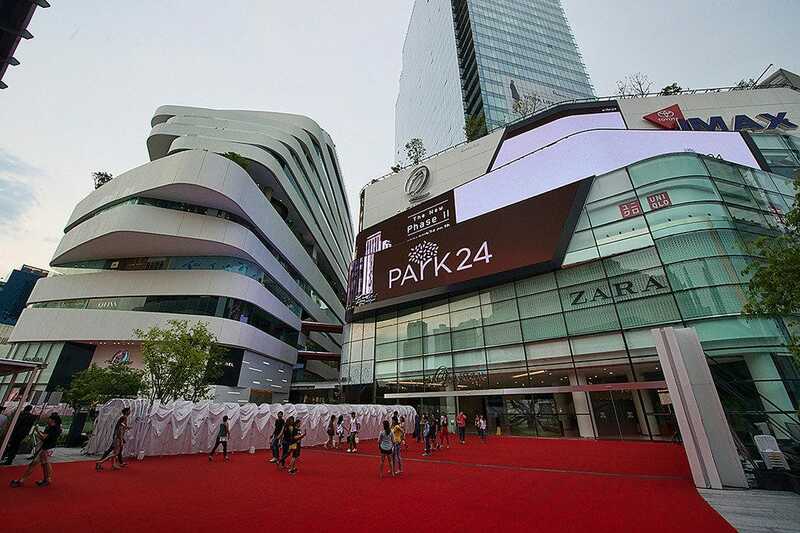 The fanciest designer brand goods are available in the glitzy upscale malls that are spread throughout the city, led by the new "mother of all malls" Icon Siam, along with the glamorous EmQuartier, Siam Paragon and the mammoth Central World. In places like this you can eat gelati or go an aquarium, sit in a Starbucks or even watch a sumo wrestling demonstration. In fact, in quirky Terminal 21, you can even travel around the world as the mall is themed to resemble different cities on different floors. Malls in Bangkok are refreshingly cool, filled with trendy eateries, Cineplex’s and bowling alleys, bookstores, cafes, and thousands of shops to choose from, not to mention that they host ongoing musical events, festivals, and an array of changing displays, making them places to spend entire days in. For those who want something a bit more unique, try the outdoor markets that are special to Bangkok. Chatuchak Weekend Market is legendary, hot and chaotic, but a great spot to bargain and people watch. The hipster retro market Talad Rot Fai is the city's biggest antique market, and has VW cocktail bars and plenty of cool stuff, plus it is a real local affair. 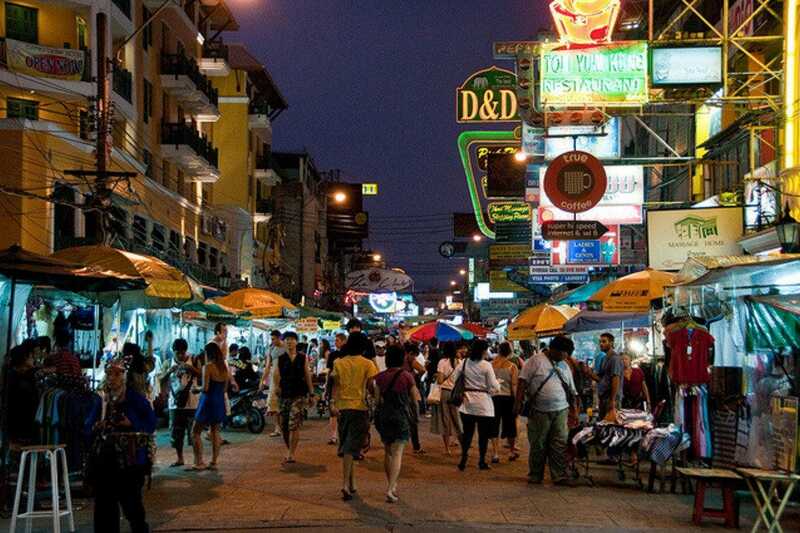 Even good old Khao San Road is fun for shopping, with hundreds of small shops and stalls catering to the tourist trade. You can get anything from souvenirs to take home here to tattoos and hair braids to make yourself unrecognizable upon return! While not the biggest or glitziest, Terminal 21 is many visitor's top choice for its design and layout. Each floor is named after a different part of the world, complete with local icons, and one can visit the Caribbean, San Francisco, Tokyo, Rome, Paris, and London merely by riding up an escalator. There are all the usual designer brand chains, as well as 44 outlets featuring local Thai designed products. There is a dazzling array of eating possibilities, from Mexican to Japanese, and the 35 baht food court has truly excellent local food. Perhaps best of all are the space age toilets, complete with bidets and heated seat covers, all the more reason to shop, eat, take in a movie, and use the privy! 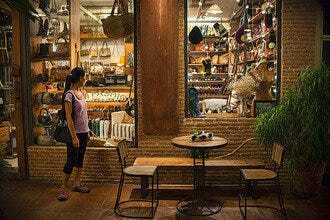 Khao San Road has gone from being a hippie and backpacker haven to moving a bit more upscale. While it still remains a place for cheap lodgings and for Thais to come and check out the foreign crowd, it also is a decent spot to shop for certain items, and with plenty of food, bars, and people watching opportunities to boot, it makes for an enjoyable trip. Some of the largest collection of second hand English books can be found here, along with typical Thai souvenirs for take home such as t-shirts, embroidered pillow covers and Thai pillows, patterned sarongs and beachwear, vintage and exotic clothing, plenty of jewelry and other objects d'art, as well as the latest DVD and CD's to name but a few, not to mention that you can get your hair braided in dreadlocks and get your body tattooed while you wait. You'll be accosted almost everywhere in Bangkok by tailors proclaiming to have the best suits or jackets made at unbelievable prices compared to back home. While the price part might be true, often the rest of it isn't, as the materials used are shoddy, the workmanship lacking, and it really isn't the deal it was cracked up to be. 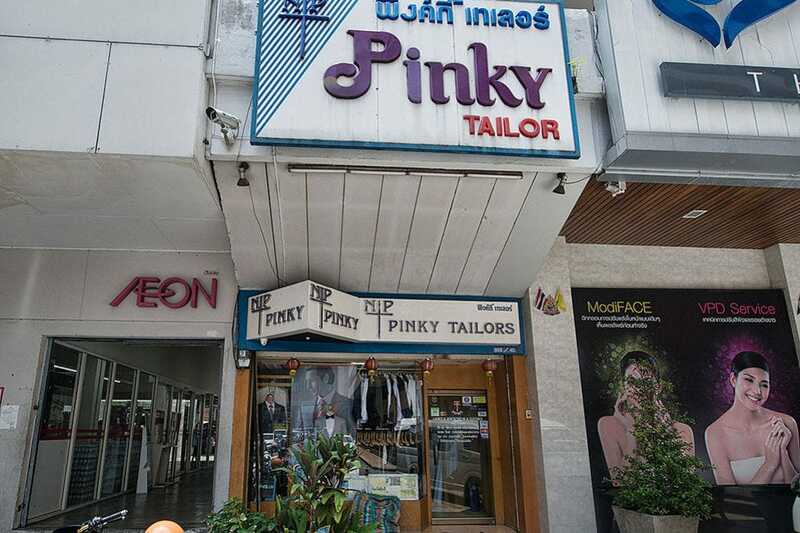 While getting hand-fitted clothing made by a tailor certainly is one reason for shopping in Bangkok, you need to choose wisely, which is all the more reason to make a beeline for Pinky. They've been in business since 1980, use high quality wool and other fabrics, and you can wander through their three floors checking out the fabrics without being hounded by the salespeople. Pinky can make you a full suit, just pants or shirts, jackets, and whether it is shirts and overcoats for women or tuxedos and suits for men, they do hand-fitting, give personalized service, and you can be assured you are not getting taken to the tailors. 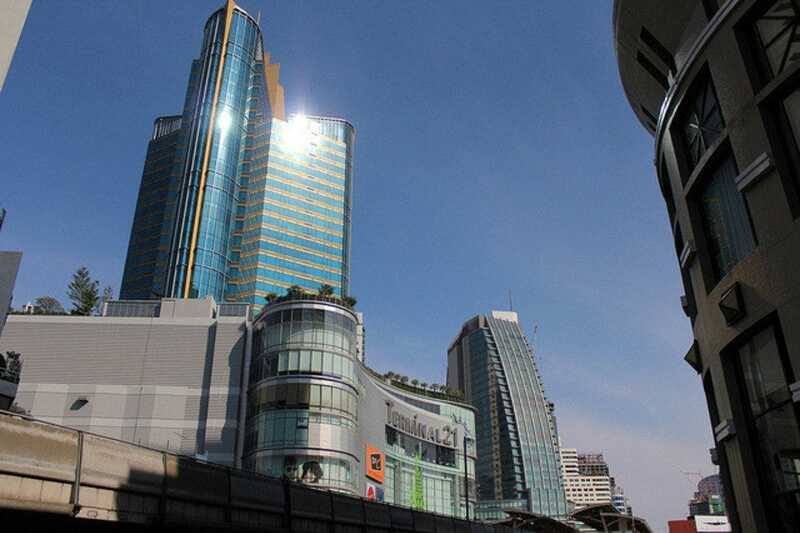 Once known as the World Trade Center, the Central World Plaza is the third largest shopping complex in Asia, and even with the opening of nearby Siam Paragon, still remains one of the top shopping draws in Thailand. The outside of the mall is thronged with visitors praying at the local female fertility shrine, as well as enjoying the daily changing exhibits and festivals that take place in the large open space fronting the complex. Inside, 8 floors host just about every shopping label in Thailand, bookstores, musical instrument shops, and much more. The 7th floor has a wide selection of excellent eateries of different cuisines, plus a gourmet supermarket stocked with goodies, and the 8th floor is home to the 15 screen SF Cinema City movie complex. This acclaimed Thai designer is Bangkok's top shop for checking out cutting edge and feminine women's clothing. Senada combines materials like Thai silks with Indian embroidery to create fashionista ready beautiful clothing for women. Established in 1991 and winner of several design awards, Senada blends lady-couture with vintage and offers some striking results which are right at the top of Thai design. The combinations of ethnic, modern, and traditional are quite impressive, and those looking for high end and cutting edge will love shopping here. 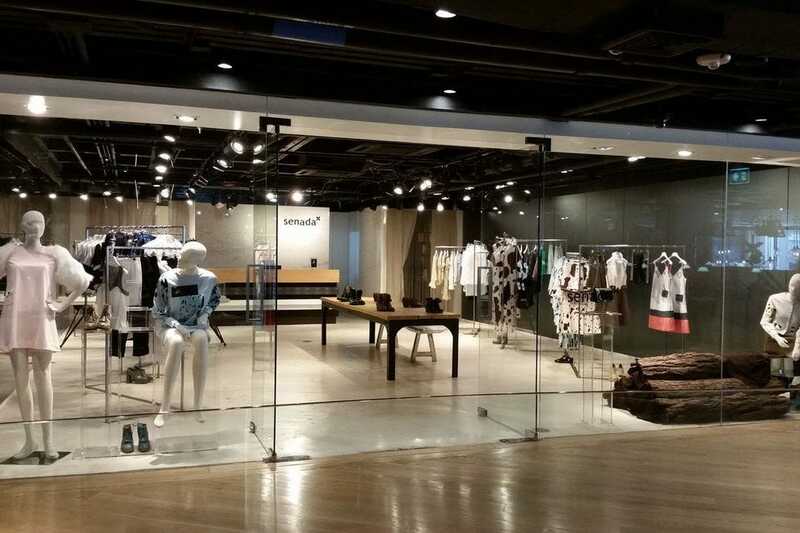 While you can find Senada products at all high end shopping malls in Bangkok, this is their flagship store and has the widest selection. You can get custom made items as well here. Also known as Talad Dek Neaw ("hipsters" market), this market, formerly located in an old train depot, has moved across the city behind Seacon Square, and become the talk of the town. 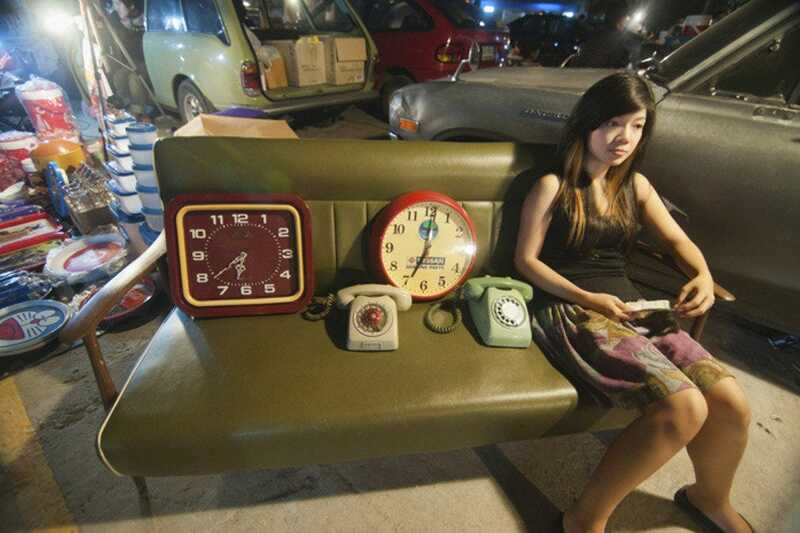 It takes place only on Wednesdays and weekends, and while the shopping starts at 4pm, it really doesn't liven up until the evening, when hundreds of vendors set up stalls selling antiques, collectables, and tons of retro items, currently a huge fad in Thailand. There are over 2000 stalls here, and the biggest collection of antiques to be found in Thailand. There are also lots of food stalls and impromptu tricked out VW bus bars, offering cheap cocktails and beer, and there are several fancier bars, located in antique shops, which feature live music amidst the great ambiance. Siam Paragon is all about big. One of Asia's biggest malls, featuring a 15 theater multiplex cinema which includes Asia's largest screen, the Siam Ocean World, which is Southeast Asia's largest aquarium, a bowling alley, a concert hall, and of course the gigantic multi-floor mall that is home to hundreds of luxury brand retail shops, car dealers, food court, and perhaps the best gourmet market in the kingdom. You can buy virtually any type of food here, from fresh imported seafood to gelato to fine wines from around the globe. The upstairs cinema includes an IMAX theater and stays open well past the mall closing hours. The EmQuartier is Bangkok's swankest luxury shopping mall. Built as part of an expansion to the already existing Emporium, the EmDistrict features several malls, of which the EmQuartier is the latest. Hundreds of worldwide name brands in fashion and beauty can be found here, from Luis Vuitton to Issey Miyake to Diane Von Furstenburg, Jimmy Choo, and much much more. At Xmas time they are having a lot of sales here, and there's always a festive atmosphere with music playing and colorful lights flashing. Additionally, the mall has a Helix Zone filled with every restaurant imaginable, from Mexican to New England seafood, to tons of Japanese, Chinese, Korean, and Thai options, and there is also an inexpensive food court. 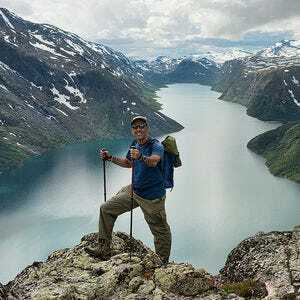 In addition to shopping, the mall has a luxury fitness center, a multiplex cinema and IMAX theater, a gourmet food market, and even a waterfall. The Virgin Active Fitness gym here boasts an altitude training room and the highest state of the art training facilities should you need to burn more calories after shopping. Shopaholics should be sated for years to come. Originally a flea market started in the 1950's by a former prime minister who wanted to put a flea market into every town in Thailand, Chatuchak, more affectionately known as JJ Market, is now the largest market in Thailand. Over 5000 stalls vie for business, selling everything from clothing to pets, antiques, plants, amulets, and plenty of food and drink. The market is now a highly touristed affair, hot, crowded, and no longer dirt cheap, yet it is still a great place to people watch, find something you don't have to buy, and the latest addition of impromptu cafes for sipping a cappuccino or having a cold beer and watching the world go by make it worth an afternoon. Note that while there are some stalls open Thursday-Friday, you really need to come here on the weekend to see JJ at its best. 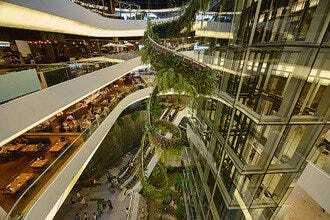 Bangkok's latest mall has to be seen to be believed. 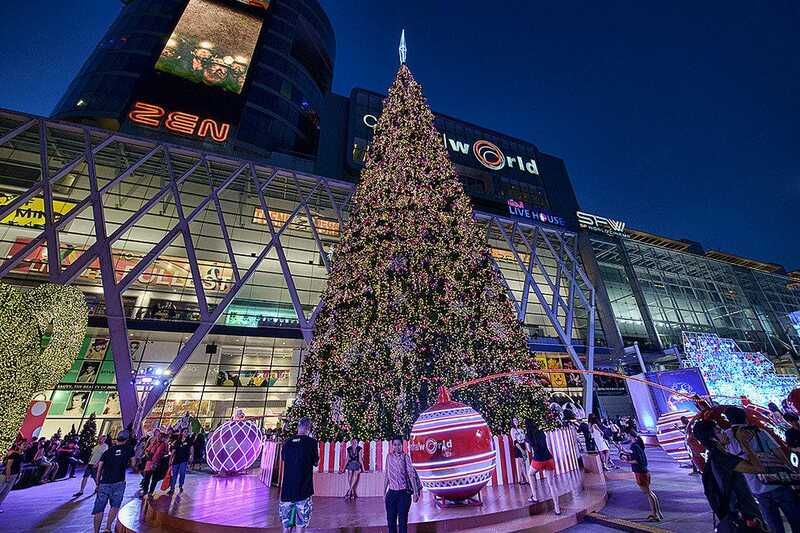 It's truly an endless string of superlatives, with over 500,000 square meters of space and some 50 billion baht spent on creating Bangkok's most impressive shopping space, it is an absolute mecca for shopping visitors. The mall features a seven-storey Takashimaya Japanese department store, two luxury condominium towers, an endless array of restaurants and eateries, fitness clubs, and even an indoor floating market, paying homage to the traditional Thai way of commerce. Thailand's first Apple store can be found here, and if you tire of shopping, you can even get a dose of culture at the Natonal Heritage Gallery museum which is also housed inside the complex! There is also a 3,000 seat cinema and concert hall, and pretty much round the clock light and fountain shows outside. You'll be hard pressed to find anything more extravagant in Bangkok, so plan to spend the day here, it's certainly the glitziest thing the Thonburi side of the river has ever seen.